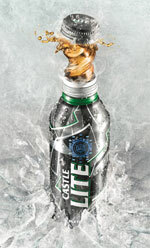 The new Castle Lite Re-Sealable Platinum Edition pack, is claimed as the first of its kind in South Africa. “Pack innovation is a key driver of Castle Lite’s growth and this new 470 ml aluminium bottle with its bold, distinctive and progressive design, is in line with the latest brand iconography. Its unique striking design will most certainly make Castle Lite stand out among the rest,” comments Andrea Quaye, General Manager of Castle Lite. “Castle Lite is renowned for being innovative… I have no doubt that through this new pack, the brand intrinsic of innovation and exclusivity will be reinforced,” he says. The Platinum Pack will only be available in Gauteng from 28th April to 30th June 2014, due to its exclusivity, and only sold at Pick n Pay’s, selected liquor stores and premium bars. The pack price will additionally ensure exclusivity for consumers. Apart from its exclusivity, the pack will offer consumers the opportunity to unlock the latest local and international music from the brand’s Extra Cold Music platform with the unique code on the pack. “Consumers who purchase a re-sealable Platinum Edition Pack will get access to five new music tracks that will be released every Friday at 9pm. These songs will be available and valid for a free download on the platform for 7 days on the music platform, after which five new songs will be released,” explains Quaye.